Become an interior designer with these best free home decoration apps for iOS (iPhone, iPod touch and iPad) and start decorating your sweet home. Are you thinking to decorate or redecorate your home, but not sure where to start? 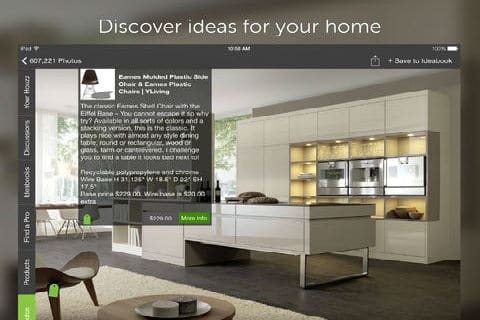 Thankfully, there are several FREE useful app available in Apple Store that will help you to decorate your home. With these free home decoration apps you can use your iPad or iPhone as a consultant for interior design and give a touch to get you dream inspiration from thousands of actual projects. So today we will discuss some free iPhone applications of decoration that we find very interesting. We have made a list of the most useful applications to decorate your home or apartment. If you like interior design, if you are looking for ideas for reform, for a new home or just if you like your perfect dream home these free apps are for you. This application provides access to a database with endless photographs to create your “ideabook”. With this Houzz Interior Design Ideas you will have access to more than 2000000 images and suggestions. The images shown on the app are proposed from top designers. You can also share your discoveries on social networks (Facebook and Twitter) or Email. Choose the options you liked most and start decorating or redecorating your dream house. MagicPlan is an application for iOS that allows you to make a plan of a house with very little effort. MagicPlan measures, draws and creates an interactive map of a house in minutes just taking pictures without having to do it manually. Once you open the app, you can view a video tutorial that shows you the best ways to work with MagicPlan. Then you can start to create your designs. Be inspired with Homestyler’s impressive projects in interior design, tips and trends. Watch how your own home design ideas come true with colors and experimenting with real products. The app offers an extensive catalog sorted according to part of the house, bathroom, lounge, kitchen, bedroom… that will help you to get a perfect idea to decorate your home. It is very attractive as all space is displayed in 3D. Homestyler is a great tool for those who want to see results before you paint an inch or buy some furniture. On Pinterest you can find all the inspiration you need to start designing the decor you require, use the search bar to get the best results. Aside from finding users with experience, you can also find different brands of furniture or other belongings so you can decorate your home in the best way possible. The app offers a wide variety of images created by professional designers and experts to find the perfect match for every area of your home. It offers a variety of high resolution photos and hundreds of options to remodel your Living Room, Bedroom, Study room, Kitchen, Bathrooms and much more. 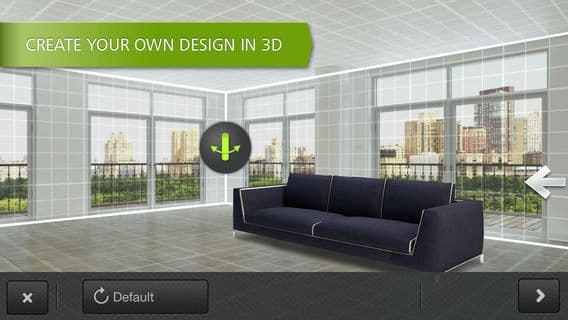 Simulate your dream home in 3D view. You can navigate ideas, styles, types of environments, colors, and more to find exactly what you’re looking for. You can even upload the designs we have done. This application takes measurements of rooms, furniture or anything else you need to measure. Photo Measures used to store photographs accompanied by easy steps to make it easier to remember the exact location of them and make sure everything fits perfectly. 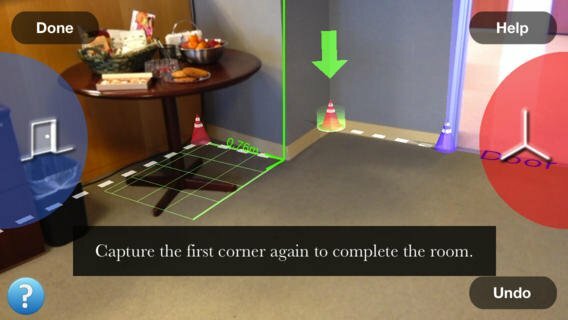 Simply take a picture of the room using your iPhone camera, calculate the dimensions, write down the dimension lines and select the unit of measure. So you can be sure exactly what size should be your furniture without using the meter. This application will allow you to work on spaces of your house as if you were working with a professional designer. You can try from textiles into your furniture in real time from the application, design furniture and try as they would observe the decor from different angles, and try color palettes. A myriad of options to try digitally then be used if you liked the idea. If you want to change the paint color of your apartment, you can try ColorSnap. This application lets you find the ideal environment for your color. You can capture different scenes from real life and create your own color palette. So you can also adjust the brightness and saturation to choose the setting that best suits you. Are you thinking about making a change in your home? What apps do you like best? Or, if you have found other helpful FREE app for iPhone, iPad that suits best to decorate your dream home then please do share them with us in the comments section. Next articleBest Free iPhone Apps For Pregnancy.